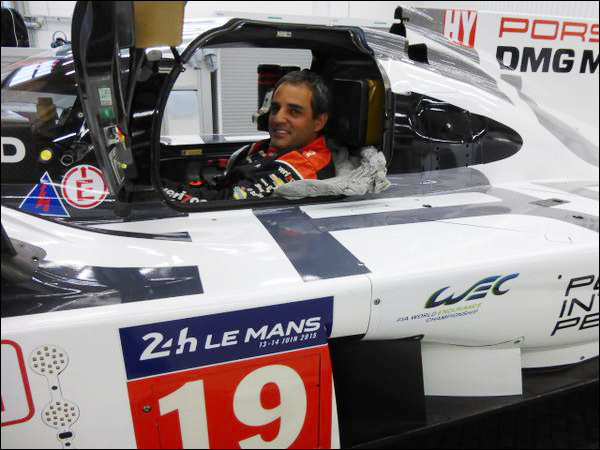 Juan Pablo Montoya is set to join the post-FIA WEC race LMP1 test session at Bahrain with Porsche Motorsport on 22 November, Porsche releasing a picture today of Montoya undertaking a seat fitting in a Porsche 919 Hybrid. After appearing as a guest of the team at the Circuit of the Americas, and with Porsche confirming that the Colombian superstar would be offered a test rumours have circulated that he might either act as super-duper-sub for the potentially Azerbaijan-bound defending Le Mans Champion Nico Hulkenberg, or be looking towards a possible 2017 Le Mans programme. Whilst the 2016 Le Mans 24 Hours has no current clash with the Indycar circus the Le Mans Test Day, does clash with the race weekend at Detroit’s Belle Isle circuit though Platinum rated Montoya could complete his required laps in Free Practice.